Sketch B (bis) Sketch showing the positions of the Buoys placed in Delaware Bay & River under the direction of the Superintendent U.S.C.S. By Lieuts. Com. J. R. Goldsborough & R. Bache U.S. Navy, 1847. A unusual triangulation chart of the Delaware Bay from the scarce 1848 edition of the Superintendent's Report. Covers from Cape May and Cape Henlopen northwards along the Delaware River past Wilmington and Philadelphia as far as Trenton. Shows the placement of various buoys established by the Coast Survey to channel shipping in the bay and river. The 1848 edition of the Superintendent's Report is highly unusual in that its maps do not have borders, was common in all subsequent editions. 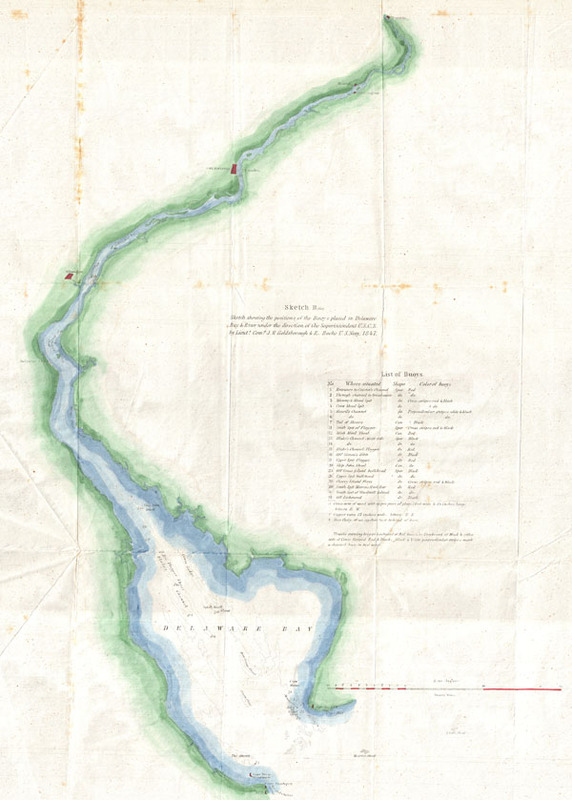 Report of the Superintendant of the United States Coast Survey, Washington, (1848 edition). Very good. Some minor spotting. Original fold lines.